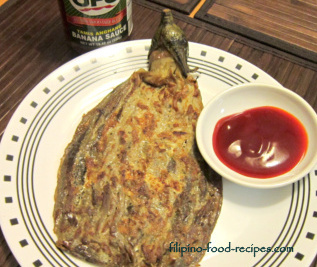 Tortang Talong is an eggplant omelet, usually with ground meat filling, and served with banana ketchup as dipping sauce. Ideally, the eggplant is first roasted on top of gas burners with the stem intact until soft but not mushy. The charred skin is then removed, and the eggplant pulp is mashed flat. Though a little tedious, this method gives the eggplant a nice grilled and partly charred taste. However, you have other easier options of prepping the eggplant for this dish. You could oven-roast -- set the oven at 350°F; and cook for 15 minutes or until soft. 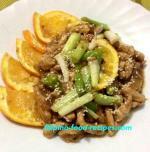 You will notice that the vegetable shrinks a little bit. You could boil the eggplant in water for 10-15 minutes until soft, but weigh down with a heavy plate to keep the eggplant submerged in water. You could use an outdoor grill for the task but make sure you brush it with oil so it doesn't stick to the grill. Now, let's talk about the meat filling. Though you could just use any meat left-over as filling, you still have to put enough binder to make sure the filling sticks securely to the eggplant once you flip it. I use All-purpose flour that I cook together with the meat -- you will notice that I didn't dissolve the flour in water but added it directly to the meat. Flour is oil-soluble so I add it when all the liquid from the meat has evaporated and the meat is cooking in its own oil. 1 Prepare the eggplants by roasting, removing the skin and mashing. Set aside. 2 Saute garlic, onion and bell peppers and tomato. Add the meat and cook until oil is coming out of the meat, about 6- 10 minutes. 3 Add the all-purpose flour, cook for 2 minutes and season with salt and pepper. Remove from heat and cool down a bit. 4 Beat the eggs, and season with salt and pepper. 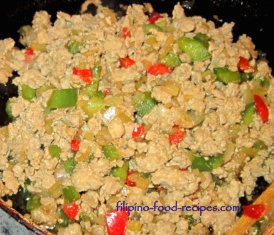 Add the cooled sauteed ground meat. 5 To make the omelet, heat up the oil on a non-stick pan, and put in the eggplant with the mashed portion flat and tight(no hole when laid flat). 6 Spoon 3-4 tablespoons egg/meat mixture on top of the eggplant and press down to come together. Cook for 2-3 minutes. 7 To flip, hold the stem with one hand and with the spatula on the other, turn the eggplant carefully with one motion, and press down. Cook for another 2-3 minutes. 8 Turn the omelet over onto a serving plate and serve with a side of Banana Catsup. If all these are quite hard for you, you could just mash the eggplant pulp, add the meat/egg mixture, and cook 1/2 cup like how you would for a regular round omelet. It will taste just the same. 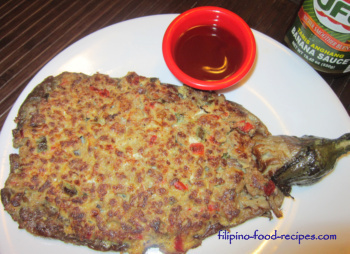 Left-over dishes like Giniling Guisado is also a perfect filling for this tortang talong. Just take out the sauce and make a binder of egg and flour.